Your browser does not support inline frames or is currently configured not to display inline frames that include whimsical art and whimsical artists. NC Whimsical Artist Scott Plaster is from the North Carolina Piedmont Triad area and has been creating whimsical paintings for 30 years. His line of "Whimsical Animals" has been featured in the Community Arts Cafe and the GoTriad NC artists section and is available for sale in art galleries, art boutiques, and shops around the NC Triad region, and from the Mountains of North Carolina all the way to the Coast. Matted ready-to-frame art repro­ductions of the original whimsical oil paintings are sold in various sizes, art note card sets, art greeting cards, art posters, and even stickers. Plaster's animal menagerie includes "Mystic Tiger," "Cosmic Cow," "Neon Duck," "Psychic Gib­bon," "Shaggy Sheep," alley cat "Miami Lewie," house cat "Cry Baby," "Pelican Peek­ing," "Crab in Space," an alligator in "Crooked Smile," and "Running Rooster." His latest works include "A Series of Four Beetles," "A Collection of Flies," and "Daytona Five." Plaster is the former leader of the Cosmic Cow Society, which promotes artists in the Triad region of North Carolina, and just started the Running Roosters. NC Whimsical Artist Scott Plaster markets a full line of whimsical art prints, whimsical art greeting cards, art notecard sets, and even art online e-cards. His free whimsical online greeting cards are easy to use and fun! 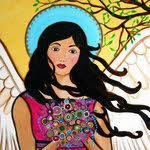 Check out his Online Art Greeting Card Site. My Very Latest, "Blue Al"
original whimsical paintings - artist prints - artist cards COCO & CO.
210 High House Road, Suite 101, Cary, NC COCO & CO. Framed or unframed prints on paper and canvas Get the Beatles Four on Velveteen Pillows! Similar to Etsy -- prints and cards Originals and specialty items All kinds of shirts! Whimsical Artists? What is a Whimsical Artist? If you like whimsical art, you should check out Art is Fun. Whimsical Artist? What makes Scott Plaster a whimsical artist? The term "whimsical artist" has been around for a while, and it is often used in differnet contexts. Some whimsical artists create images using child-like characters resembling cartoons. Other whimsical artists might create surreal "fantasyscapes" or otherwordly images. Scott Plaster's "whimsical animals" are different, but he still likes to call himself a whimsical artist. His whimsical animals are not cartoon-like, but they have a unique blend of realism and the whimsical, surreal quality that other whimsical artists capture in their work. Whimsical artists might not always agree on what the term means. What do you think? Respond HERE. 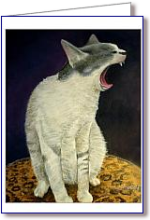 Whimsical Artists Manifesto, Part 2: The Whimsy of Our "Whimsical Animals"
I am a featured artist on a national website! A detailed interview is featured on the Whopple homepage this week, but you can link to it directly HERE. 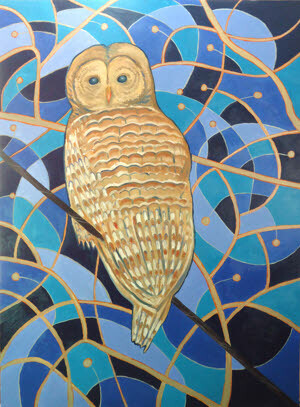 Anne Marie from Whopple.com says, "Your artwork is beautiful and your interview is really wonderful. Tons of fun." 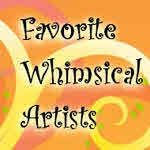 I am honored to be featured and have a chance to talk more about my whimsical art! Whopple features artist interviews from around the country and submits press releases nationwide to a wide range of galleries and arts organizations. Tell us about your first attempts to be creative. How many hours a day do you create? How did you pick your creative medium? What is your favorite art related book? How do you recharge when your creativity hits the wall? What gives you hope in the world? What has been your most exciting moment as an artist?